DVD GIVE AWAY OF BLUE RAY FILM KODACHROME. hushhushbiz88@gamil.com Name address and phone and to be in the draw we be put on our subscription to our newsletters and our utube page. https://www.youtube.com/watch? The comp will close off 28th August 2018 .. Good Luck. The film is now coming out on Home Entertainment and the story follows on Matt, a struggling executive, finds his world turned upside down when his estranged father’s nurse shows up unexpectedly in his office. 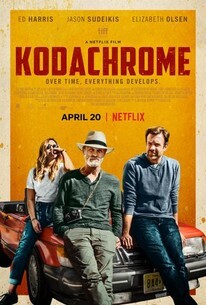 Matt’s father, a famed bad-boy photojournalist, is facing terminal cancer and his dying wish is for Matt to join him on a road trip from New York to Kansas to process his last rolls of Kodachrome film before the sole remaining lab closes and those captured moments are gone forever.